In this article we will dive deep into ASO (AKA App Store Optimization) for Android apps on Google Play Store. We have written a complete guide on how to optimize every element of listing in order to improve the visibility and boost organic downloads in the year 2019. Are you launching your first app on Google Play Store? Are you choosing your first app keywords? Sure you have a lot of questions and, maybe, need some help. Our play store optimization guide will show you what to do and how to do it. Let’s start! Update: we have just published a complete App Store ASO guide. Check it out! There are currently, more or less, around 5 million mobile apps and games on the biggest stores: Apple App Store and Google Play Store. The stores keep on growing exponentially and getting more competitive, so achieving good visibility on the stores has become the biggest challenge for developers and marketers. App Store Optimization is an essential strategy for mobile iOS & Android businesses, and a great solution to maximize visibility, improve search rankings, increase the conversion rate and drive more organic installs. ASO, or App Store Optimization, is the process of optimizing mobile apps and games to maximize visibility and improve the conversion rate to install. It is sometimes called an “App Store SEO” because of its similarity with Search Engine Optimization, but technically, ASO is not only about visibility in search, but also about conversion rate optimization. It’s important to remark that ASO is not “SEO”. 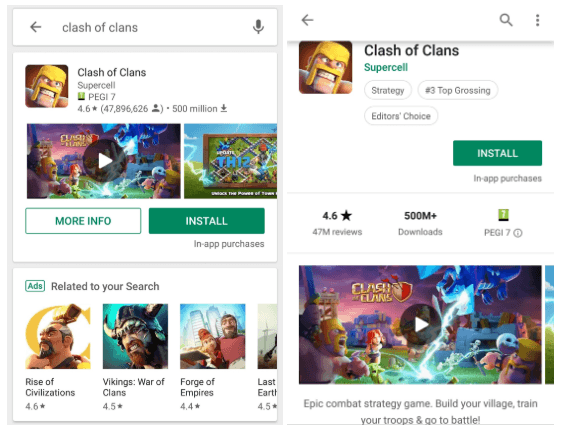 SEO for Google Play exists, but although it’s related, it’s not the same thing. Google Play search optimization starts with market and keyword research. Market research, paired with Keyword Research and Optimization, is the first step to do when implementing an ASO strategy for your app or game. Knowing your niche on the market, who are your competitors and what tactics do they use, is extremely important in order to learn how to outrank competition and get more downloads. For the new applications, though, it can be quite challenging to fight for top search rankings for popular search terms, so the best strategy for keyword optimization is to choose the right keywords. In the beginning it is most recommendable to go for mid- and long-tail keywords, that are a combination of keywords for a more specific search. Around 70% of search queries are long-tail, and the conversion on these terms is usually higher, because of the higher probability that the user will find exactly what he was looking for, using a specific search. Long-tail keywords have less volume of traffic and less competition, so you should try to target as many different combinations of long-tail keywords as possible, and cover a big area of possible search queries related to your app. This way, you will expand your outreach and maximize your visibility in app store search. On-metadata are the factors or elements that are 100% under the control of the developer: title, developer name, short and long description, icon, screenshots. Off-metadata factors are not controlled completely by a developer, but can be influenced, for example: installs volume, ratings, and user reviews. View all Google Play ASO factors and more ASO Tips. Some of these factors affect Search Rankings on Google Play, some can influence the Conversion Rate, and some of them can have an effect on both (such as description). Later in this post we will take a look at how the ASO optimized elements of listing on Google Play Store would look like. It doesn’t really matter if your Android application is already published on Play Store or you are just preparing its launch: you need to to work on your strategy and correctly implement it. But the results are not always going to be the same as you expect. You can have what seems to be a great icon and feature graphic, but if they are not converting your visitors to installs, they don’t really work! And the same strategy doesn’t work for 2 apps – every app is different, and so is the ASO. So stop guessing… and start A/B testing! A/B testing is a comparison of two different versions of app listing against each other to identify which version has better conversion (clicks or installs). During the experiment, you drive the half of your traffic to the option A, and the other half to the option B, comparing them to see which one has the best performance. Google has its own A/B testing tool integrated with the Google Play Developer Console – check their guidelines on how to perform better A/B testing and start experimenting! The best practice is to keep track of the most important KPIs of your app weekly (ideally, daily): the volume of installs (organic + non organic), keywords rankings, top charts rankings (overall, category, etc. ), ratings and reviews. Revamp your keywords and remove the ones that don’t perform anymore, try experimenting more with the graphic elements and keep on A/B testing until you find the best-converting combination of the elements of your listing on Google Play Store. Take care of your users, try to provide the best user experience, and keep up with the user reviews. Google Play offers a possibility to interact with users, reply to their reviews and even convert negative reviews into positive. A strong positive user sentiment is an important factor, that favor both search ASO (Google ranks the applications with more and better reviews higher), and Conversion Rate of your listing (convincing users of the high quality of the app). You can read more about handling user ratings & reviews and become an engagement pro! And remember – the key to success is, above all, a great product! Optimizing a listing for Google Play Store can improve keywords rankings in search, conversion rate to install and drive more organic downloads – so if you haven’t done it already, now is a great time to start! Having an ASO-optimized Google Play Store listing can help you not only to boost visibility in the store, but also in Google Web Search and App Packs! Read more about SEO for apps and App Packs. Title is the first and one of the most important ASO on-metadata factors, because it has an effect on both search results and conversion rate to install. Since June 2017, Google permits to include up to 50 characters in the Title (while Apple has shortened the App Name, instead, from 50 to 30 characters). To maximize the use of this space for your app optimization and improve keywords rankings, add some of your most powerful keywords to your Title alongside brand name. Keep your brand name short, clear and easy to spell for your potential users, and try to add emoji to instantly grab users’ attention when they are browsing on the Google Play Store. Curiously, the URL (package) can be a very strong ranking factor for app store search if you include some keywords there. Check the Google Play Store package URL before publishing your app, because once it is set, you can’t modify it later. Read the case study from Daniel Peris about URL / Package as a Search Ranking Factor in Google Play Store. It is incredible how with a boost of installs, Nintendo’s hit Super Mario Run game that had a keyword “zara” in the URL, started ranking for this really competitive keyword. Developer Name is another important on-metadata factor that has an effect on app search rankings. Apart from this, Google keeps a record of developer history, and the apps with positive developer history tend to be ranked higher in Google Play search. A short description on Google Play Store affects search ASO keywords rankings and conversion rate. You can include up to 80 characters in the short description field, and it is very important to keep the balance and provide a clear description, including some of your main keywords that you want your application to rank for. App Description is an extremely important ASO factor, affecting both Search and Conversion. Google’s search engine is crawling through the app descriptions, and uses the keywords that it has found (mainly in the first and last 5 lines of text). This is why, your Long Description, should, first of all, be searchable. You have up to 4.000 characters (use as much as possible) to include as many keywords and keyword combinations as possible. Use your most important ones a few times, especially in the first and the last lines of text, but please – no keyword stuffing! It is not only penalized by Google, but will also have a negative effect on the users and discourage them from trying your app. Secondly, the description must be organized and well-structured, containing clearly all the information valuable for the user and convincing him to install your app (convert into your user) with a powerful call-to-action, so your Long Description has to be actionable. Use as much space provided for a Long Description as possible (at least 3.000-3.500 characters). Localize your description to all possible languages. Preferably, use a help of professional instead of a blind translation. Describe the virtues and all the best features of your app – it is okay to brag! Find mid and long-tail keywords (keyword combinations) to add to your description. Use bullet points or Unicode symbols like ✔❖➜ (get them here) for a clear and visual organization. Don’t overload your description with a lot of text – write in short paragraphs. Include emoji 🔥 or use HTML and Rich Formatting (read our guide for more tips on that!). Mention your awards or contests to encourage your users to give it a shot. Mention your social media profiles or user communities for your app. Icon is the first visual element of your app that the users see when they come across it in the search results page or Top Charts. Therefore, an icon plays directly affects click-through rate (how many users visit your listing after seeing a preview in Search / Top Charts), and of course, conversion rate (how many users will download the application after visiting listing). There is no doubt that the icon is an element that has the most influence on user decision whether to take a look and install an app or not. So, icon is an on-metadata factor responsible for Conversion. Here you can see the view that the users get in the Google Play Top Charts and search results. A striking, distinctive icon is what can really influence the users to try out your app. Make sure your icon is clearly reflecting the main purpose of your app – don’t confuse the users unless you already have a strong brand. Find your “style” – colours, typography, etc – and stick to it, so you icon goes in alliance with the other elements of your app. Take a look at your competitors and make something different. Use vibrant and harmonizing colors and clear shapes, don’t overload your icon with too many elements. Avoid having text in your icon. Try adding borders to the icon to make it more eye-catching. Don’t try to guess what icon your users will choose – use A/B testing tools to know exactly what icon performs best for your app. Read more about how to pick the best app icon in this case study by Incipia, and get some more inspiration on amazing icon designs at Creative Bloq. You can localize your video in all the languages that your app is available for. Upload one video for each language, or just use transcripts in different languages, which Google will automatically show depending on user location or device settings. One of the coolest things about adding a video to your app store listing is that the views from Google Play Store count as YouTube views. This gives you higher YouTube rankings, and therefore, higher positions in Google web search results! Be sure to check out Apptamin’s guide to video marketing and remember that you can also make A/B testing experiments on your Google Play Store video to identify the top-performing one. Like other graphic elements of listing, screenshots are the on-metadata elements that are responsible for ASO of Conversion Rate. They don’t have such a huge visibility on Google Play (comparing with Apple App Store), because the user has to scroll through listing to get to see them. But still, the screenshots remain to be essential for the users to see how does the app look like from inside. Just taking a glance at the screenshots, users will already decide if they want to try the application or not, so it is extremely important to make a great first impression on the users. Make sure you showcase your best features on the first two screenshots. Read more about How to Create Outstanding App Screenshots in our ASO Academy and check out the 10 Best Tools to Design Mobile Screenshots. Put your best features or the most important messages to the first 2 screenshot slots. Use all available screenshot slots, don’t stop on the 2 minimum required ones. Use text to explain the information on the images to the users. Follow your app’s general style and theme, experiment with creating storylines. Provide a challenging copy to encourage users to install your app. Show special offers or discounts to give them more visibility. And never forget to A/B test them to find the best ones for your product! To get some more inspiration, check out the 10 Styles of App Screenshots that you can use for your own app. Your Google Play Store page is a great scope for optimization and experimenting with different elements in order to find a perfect combination that will increase Search and Top Charts rankings, and at the same time convince users to download your Android app and thus, improve your Conversion Rate to install. Also, if you do App Store Optimization, you are optimizing your play store listing for SEO. What do you think of our ultimate Google Play ASO guide for 2019? Tell us in the comments! Sharing is caring! If you know someone who will enjoy this content, feel free to share it using share buttons. Thank you! Absolutely 🙂 just a typo. Thank you Pablo! Nice Blog. I get a clear visualization of ASO with this and the links inside it. Thanks For it. Thanks a lot for share an updated ASO Strategies News. Hi, Kate, It’s really cool and useful post, like an ASO road map! Thank you! I have a question about AppStore ASO: Is combination of words from app name and from keywords searchable in App Store. Will be combination like “wet dog” and “hot chikken” avaliable for the search? The answer is yes: combination of words from app name & keywords field are searchable in App Store Search. What’s the best tool from your point of view to find best keywords for description? There is no “best tool” but a combination of tools that really works. The power is in your mind! The best ASO guide for android I have read. Thanks a lot for this post. Excellent article. I am searching for proper ASO tutorial for my company product. Hi, on most of the related searches my competitors app is displayed even though that keyword is not used in his description or title, while my app isn’t displayed in the search even after using that keyword in the description. Any particular reason regarding it…..
On Google Play, it is also possible that the keyword has been used in some user reviews for the app and thus can rank for this keyword. on of the most beautifull and helpfull ASO guide, thank you very much. Excellent article for the beginners of the ASO. Just what i was looking for thanks for sharing. Short and really helpful. You covered the most important things to consider when uploading a new app not only for the first time. I have found a situation that I don’t understand. In some cases, for exemple when I check the app rating in Google Play I see that the app has no rating, and when I check User feedback > Ratings in the Play Console I see that the app has ratings. Is because the public ratings are from app last version? Is because, for example, the users that rate it didn’t open the app? App stores need a certain volume of ratings in order to show them on the listings. Because of that you can view them in the console (private) but not in the product page. Also, sometimes, not all ratings / reviews are shown in the listings. Thanks Daniel for your quick answer. > It’s strange, because I have some apps with only one rate/review (mine) and I can see them in the public listing. > It’s what I think. Somebody know the logic behind this? It’s about installation, openings, other reviews,? Loved the trick of adding keywords to the developer name. Awesome! I would like to know whether reviews/reply plays any role in ASO ? If I place some keyword while replying reviews, will it be helpful ? Thanks, Great information provide for ASO. This is a great blog regarding ASO. Great insights and amazing strategies for app marketing and mobile growth Katerina! 😊 This year we already enter 2019, wondering if these strategies would apply the same? As we all know Google and its friends often update their algorithm. 😁 Looking forward on your next post about how to do keyword research for Google Play Store Optimization.